The 67th annual Primetime Emmy Awards, hosted by Andy Samberg, took place on Sunday Night September 20th. The awards were presented during a FOX live telecast from the Microsoft Theater in Los Angeles. In Samberg’s first time as host, his opening was like the opening skit of an episode of SNL and starred some of this year’s nominees…it was awesome! It felt like he hit the nail on the head in terms of providing the new angle the Academy was looking for when they chose him as this year’s host. Some of the best moments of the night included Ricky Gervais pretending he won the Emmy, the “World’s Best Boss” mug for Lorne Michaels (but actually Shonda Rimes), Andy’s performance of “I’d Like to Give the World an Emmy”, metal detectors on the red carpet, and Tracy Morgan’s appearance to announce the winner of Outstanding Drama Series. VEEP won Outstanding Comedy Series. Julia Louis-Dreyfus won Lead Actress in a Comedy for her role in VEEP, and Tony Hale won Supporting Actor in a Comedy for his role in the series, his second category win for the role. Jeffrey Tambor won Lead Actor in a Comedy for his role in Transparent, Jill Soloway also won the Emmy for Directing for the series. Allison Janney won Supporting Actress in a Comedy for her role in Mom, her 7th career Emmy. Olive Kitteridge swept the Limited Series categories wining 6 Emmys for Writing, Directing, Supporting Actor, Lead Actress, Lead Actor, and Outstanding Series. The one other televised award in the category, Supporting Actress, went to Regina King for American Crime. Game of Thrones won awards for Directing and Writing in a Drama Series, Oustanding Drama Series, and Supporting Actor in a Drama for Peter Dinklage. Uzo Aduba won Supporting Actress in a Drama for her role in Orange is the New Black. Jon Hamm (finally) won the Emmy for Lead Actor in a Drama for playing Don Draper in Mad Men. Viola Davis took home Lead Actress in a Drama for How To Get Away With Murder, making her the firs African American woman to win the category. One thing I personally enjoyed was the way they announced the nominees for Writing and Directing in a Comedy Series by asking the writers what was the hardest part of writing for a comedy and directors what are the best skills to have as a Comedy director. Orphan Black star Tatiana Maslany looked fabulous in a Bouchra Jarrar Couture ivory tuxedo. Taraji P. Henson of FOX’s Empire looked incredible in custom Alexander Wang. 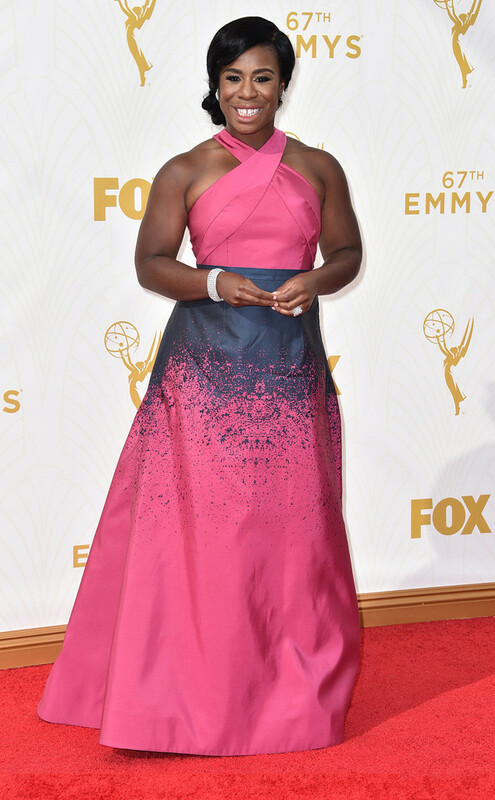 Orange is the New Black‘s Uzo Aduba looked marvelous in Jonathan Cohen. Claire Danes looked magnificent in a rockstar-esque Prada gown. Mad Men‘s Christina Hendricks looked stunning in Naeem Khan. Of course, there were many more stunning looks on this year’s red carpet! To see all of those looks check out the Red Carpet gallery here.